As a comeback movie of Yoo Seung Ho I had a lot of expectations. I liked the cinematography but other than that? Hmm. The movie fell short of my expectations. The movie didn’t really hit me hard despite the great idea behind it. Why? Keep reading. It was good from start to finish except Go Ara and Jo Yoon Hee. Go Ara pretty much nailed almost all of her scenes but she looked awkward at times. Jo on the other hand, was awkward from start to finish. Her acting style was just not my favorite and the way she acted was just awkward. Kwak Do Won played another wicked character. He seems to play this type of role pretty often. The Magician didn’t let Yoo Seung Ho to exploit his acting to the fullest. His role here was to be the pretty one and so he did it. He became the pretty one with long hair and one blue eye. His character didn’t have that X factor to be remembered and didn’t leave any big impact on the viewers except he had one blue eye here. As a comeback project after serving the county for two years, The Magician just felt short of expectations and can be categorized as a fail comeback project. This is something that I really want to point out from this movie. I loved how every scene was filmed. I liked the camera angles. I liked the sets. I liked almost everything. The scenes were sleek and looked very polished. The movie was pretty to look at. Other than that? I’m not really sure. The magic shows were filmed artistically. I loved it very much. I loved the CG. It looked slick and nice. I loved the sets. I liked how they played with different kind of color settings(?). It was all dark then it became bright. And bright settings only used when the OTP were in happy mood. Like it reflected their heart. You know what I mean? How to explain this. But you get what I’m trying to say, right? The editing felt sloppy and random at times. But gotta admit that the magic show was just an inch away from perfection. I loved the magic show! It was really extravagant. Things like magic is still pretty rare to be used in k-dramas/movies so I found it really refreshing that this movie went with this idea. The plot as a whole was lacking and felt random at times. There were plot holes, obviously. No plot is flawless. Even the best drama/movie plot has at least one plot hole and so is this movie. It’s not really an extremely fatal plot hole but in my opinion it could be approached/written from different perspective to better the scene. One example for this is Yoo Seung Ho’s character, Hwan Hee. He had 2 different sides of him; the humble and the spiteful sides. I wanted to know what made him like that. Like, what kinda of things that happened to him in his childhood that made him like that. Because his childhood story that’s being shown in the movie didn’t really give any hint that he’d grow up to have two completely different sides of him. Another example is, Hwan Hee’s relationship with his older sister, Bo Eum (played by Jo Yoon Hee). They had such a complicated relationship where their relationship wasn’t in bad term but also wasn’t in good term. It’d be nice to know what made them like that. Nearing the end, the movie got really gory and violent. Was that all really necessary? It could be toned down without sacrificing the writer’s purpose of doing that, Gwi Mol (played by Kwan Do Won)’s revenge . It was such a turn off. I know that violence is an unavoidable thing in sageuk dramas/movies but the violence and torture in Joseon Magician was really disturbing. The movie is that type of movie that will be forgotten really easily. The plot was not strong enough to make it a memorable movie. The magic thingy was great but other than that? Nah, no scene was memorable. The one scene I truly liked is the OTP’s first encounter. It cute and fun. The movie was just a good enough movie. It wasn’t something like whoa I’m extremely impressed kind of movie. The movie didn’t get to meet the break even point and I think it deserved it. The movie was kind of confusing. I didn’t fully understand the movie especially the beginning of the movie and the OTP’s boat scene. Maybe because the sub didn’t do justice or something like that. But the acting was already lacking here. Every good plot needs to be supported by good acting but Joseon Magician just lacked in both. The movie wasn’t addicting. I watched it three months ago for the first time and watched it the second time yesterday to write this review because honestly, I forgot everything. The second time I watch it, I skipped like the whole thing. It became boring, it became flat, and it wasn’t as exciting as when I watched it for the first time. Some great movies can be watched a thousand times without boring you let’s say Too Beautiful To Lie. I’ve watched Too Beautiful To Lie for a thousand times but never even once I get bored. Another example, a movie that’s also sageuk, Sado/The Throne. I’ve watched it 4 times already and let me tell you,I still get goosebumps watching the Crown Prince bangs his head to the ground and I still cry like a baby at the last 30 minutes of the movie. Joseon Magician lacked that addicting element. It’s forgettable. 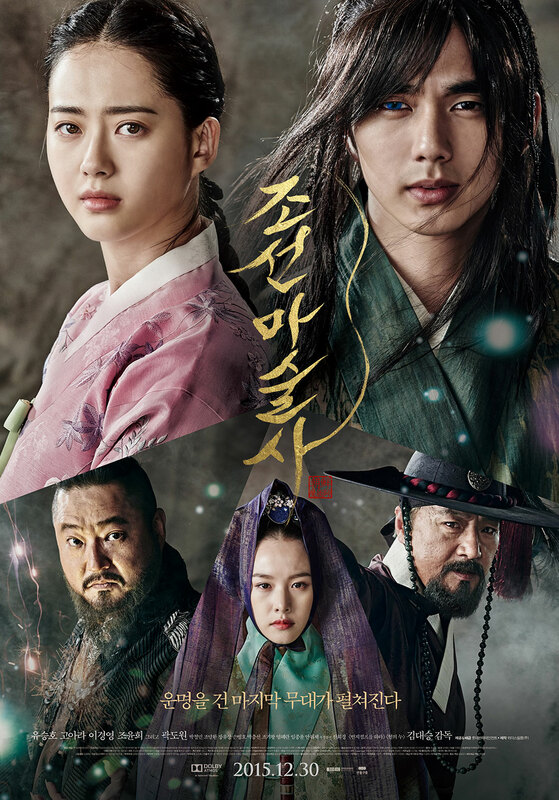 As a whole it’s a decent movie to kill time if you’re a fan of Yoo Seung Ho or Go Ara. I wouldn’t recommend this to someone who asked for some recommendation though. Despite the pretty cinematography the movie lacked in so many ways. Don’t watch it with underage kids. The gory parts are such a horrible thing for them to watch. It gets 3 out of 10 from me.